Let’s take a look at exactly how important a Knowledge Management System for Sales Team is and how you can help them sell better by having a knowledge management system in place. We have all heard the phrase “knowledge is power”. It’s a cliche, but stands true, especially for your sales team. It’s one of the most important tools your salespeople can have. Only when you have a combination of 1) the right information about what you are selling, 2) the right training to sell that thing, and 3) the right information about the prospect you’re selling to, can you sell! Even though it’s the job of the sales team to sell efficiently, it’s up to the company and sales management to make sure salespeople have all the resources they need to get the job done. But first, what’s knowledge management? Knowledge management can be defined as the process of creating, managing, and distributing knowledge and information of an organization. The knowledge shared in turn helps to solve problems and meets the goals of an organization. Thus, a knowledge management system is a software that provides a central repository for all information, data, and knowledge, thereby facilitating easy storage and retrieval. Knowledge management systems help employees and executives cut through the noise, share information, and improve their decision-making. Got it. 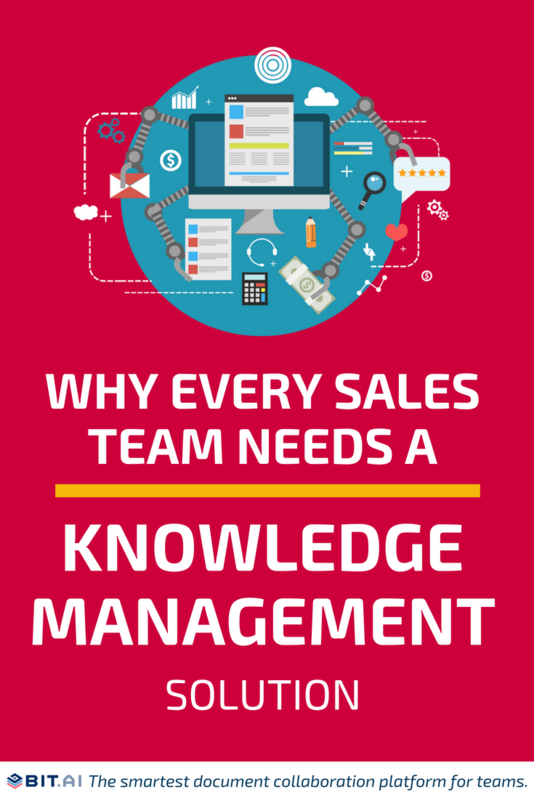 But why are knowledge management systems for sales teams so important? Sales teams are on the frontline of your business. They are the ones interacting with the most valuable assets you have – your customers. Salespeople are the ones who upsell to existing customers, create relationships with new prospects, and help them understands the benefits of your product and services. All of this, in turn, brings in the profits of the company. 1.Where is that important file? Sales people have to access a tremendous amount of information and create custom responses, outreach, sales pitches, presentations, personal documents and more. The more content that is created that they need access to, the more difficult it gets to find the right content at the right time. According to the numbers, salespeople spend on average almost 40 percent of their time looking for or creating content for customer communications. On top of that, reps spend around 23% of their time searching, creating, or updating work documents. Add to that the time salespeople spend on traveling, training, helping peers, and other administrative tasks. Now the total time spent on selling actually looks pretty low. One way to make life easier for sales professionals is through a central repository that contains their files, sales collateral, customer information, and other sales enablement documents. Central knowledge management bases help sales professionals focus on selling and spend less time searching for important information. Did you know that 73% of sales teams say collaborating across departments is absolutely critical or very important to their overall sales process? Most sales teams work with different departments like marketing, research, product, IT, executives, finance, legal, etc. to get the most out of their work and sell effectively. Sales and marketing misalignment costs businesses, one trillion dollars each year in decreased sales productivity and wasted marketing efforts. Almost as much as 90% of the content produced by marketing is never used by sales. There’s a big difference between creating content and putting the content to use effectively. Every day, there’s so much content created by both sales and marketers, from proposals, blog posts, customer success material, product videos, how-to guides, whitepapers, case studies, data sheets, etc. Marketers are consistently creating content to make a case for your leads and help you sell better. Salespeople are already leaving a huge chunk of the pie by not making use of this valuable content. Lack of proper communication and co between sales and marketing teams lead to a huge productivity as well as financial loss to organizations. A major reason for this is the number of tools we use on a daily basis to create, store, and share our work across departments. Content flows from all over – email, cloud storage, desktop, chat apps and more. It is a mess. You create your documents in Google Docs or Microsoft Word, share them via email, Slack or any other messaging service, and store them in Google Drive, Dropbox, OneDrive or some other cloud storing service. Basically, you create your files in a document editor, share them via email, get notified about the email via a messaging app, and store it in the cloud. Don’t even get me started with those messy weblinks that float around everywhere!. Knowledge management for sales team can help keep all of your documents, media files, conversations, in one place, replacing the need to find the right file from hundreds of apps and tools your company use to get the work done. 3. Salespeople are just not there yet! 77 percent said the reps didn’t understand the issues they faced or how the company’s product could help. Apart from knowing about the product/service they are selling, salespeople need to be armed with all the possible resources they need to sell effectively. Understanding about their customers, their wants, and needs, demographics, what stage of the buyer’s journey they are in, along with important sales enablement tools like access to training documents, case studies, sales scripts, datasheets, product information, etc. needs to be the topmost priority of the sales staff. As a result access to information and knowledge should be a top priority of the company. A knowledge management system for sales teams thus becomes critical in keeping all of these resources in a safe and secure place which can be accessed anytime a sales rep needs it. How do I find the right knowledge management tool? Businesses are leaving gigantic amounts of money on the table by not having the correct processes, procedures or systems in place to create, manage, store and share organizational knowledge with the employees, especially the sales staff. Now that you know the importance of knowledge management for sales teams, its imperative to know what are some basic features every knowledge management system must have to be of good use to salespeople. A knowledge management tool must act as a central repository for key organization knowledge and assets. It should facilitate the process of information storage and retrieval. At the same time, it should be easy and intuitive enough for anyone in the organization to use and benefit from. A good knowledge management tool must allow real-time collaboration. This will give knowledge workers aka your sales staff, the opportunity to work together with people from different departments- marketing, design, legal etc,- and brainstorm ideas, innovate and solve problems with their collective experience and knowledge. A knowledge management tool should make the process of documentation and content creation, as easy and robust as possible. It’s important that you can share knowledge that isn’t already created but also be able to share current and ongoing knowledge as well. Apart from creating and storing sales collateral, sales teams can also use knowledge management systems to store valuable customer feedback, suggestions and experiences. This will allow new salespeople to learn from the knowledge and experience and provide a much service to future customers. Collaborative documents are a great way to share this collective knowledge. Make sure that the documents allow co-editing and are flexible enough to include various types of digital content. Finding the right content at the right time can make all the difference between closing or losing a client. Since a knowledge management tool is used to create, manage and store knowledge of the entire organization at a single place, it’s imperative for it to have a powerful search feature to locate content quickly. Knowledge is only useful when the right information is made available at the right time. You want to reduce the amount of time your team spends looking for a particular file or document. Your knowledge management tool must have the ability to add tags, titles & descriptions to every piece of digital content. Smart filtering helps to facilitate a more accurate search. Your team needs to be able to categorize and add details to make information easier to search, find and work with. Knowledge can take any form, from your documents, files, presentations, PDFs, Excel sheets, SlideShares, YouTube videos, web links, images, logos, GIFs, audio files or even social media content. It’s important for your sales team to have all this information in one place. Having a content library allows you to store all of your organization’s media assets at one location, making it easy for employees to store and access key information quickly. Make sure the knowledge management tool has features like “restricted access” or content control so that only people with access can view and share those digital assets. An effective knowledge management system must be able to support a large number of users and huge databases. It should be flexible enough to grow with your growing team and support a large number of new hires and subsequently, more content. A knowledge management system must support effective user management. You should be able to manage user roles and permission levels that work for your organizational structure. Features like password protection, document tracking, file access restrictions, etc. are important to keep vital organizational data safe and secure. The goal of knowledge management is to allow sharing of knowledge and information amongst team members across various departments for effective decision making and collaboration. A knowledge management tool should facilitate this process by breaking down organizational silos and allow smooth flow of cross-departmental information sharing. Which is the best knowledge management system for sales teams? Even though there are a few knowledge management systems for sales teams on the market today, the one with all the features mentioned above (and more) is Bit.ai. 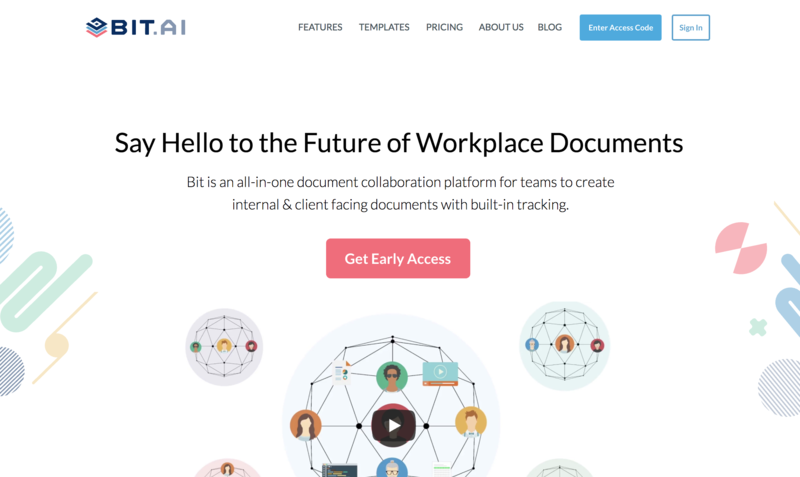 Bit is a new-age document collaboration and knowledge management tool that helps teams to collaborate, share, track and manage all company knowledge in one place. It’s a wonderful way to manage projects, create client facing material, brainstorm, share meeting agendas, create proposals, and most importantly, share knowledge! And thanks to it’s smart editor, Bit makes the process of documentation and content creation quick and easy. Trackable: Once you are done creating your sales collateral, you can send it to your prospects, partners or clients with a unique trackable link. You can then gather real-time insights to understand how users interact with your content, how much time they spent on it, how often they have returned to it and how far through the content they scrolled, along with other great engagement metrics. This data is extremely useful as you can instantly receive feedback on your proposal and make changes to improve the sales collateral you and your team create. Lead capture: Lead capture forms plays a big role for salespeople to get prospect information quickly. With Bit, you can attach a lead capture form to every content you create. This allows you to collect your audience information (name, company, job title, email, phone number, etc.) before they view your Bit white paper. Content Library: Bit has a Content Library that automatically saves the images, files and digital content you add to your documents so that you can access and reuse them easily. No need to message, slack, or email your co-workers asking for your company logo or that product video and disturb their workflow. Everything gets stored in the content library for you to explore! Workspaces: Smart workspaces are created around projects, teams, departments, and clients to keep your documents, data and information organized. Workspaces make it easy to collaborate and ensure that the right team members have access to the right documents at the right time. They are fluid so your information can move through your organization’s workflows. Permissions: Bit allows users to manage permissions and information access that suits your organizational needs. It supports features like document tracking, password protection, file access restrictions etc that help keep your important company information safe. At companies that excelled at knowledge management in their sales activities, the number of sales reps meeting or exceeding their quotas increased by 25 percent. Having a knowledge management system in place for sales teams allows salespeople to get the right content, at the right time, at the right place, and in the right format quickly and easily. It helps in storing all company-wide content and knowledge in one place, speeds up the training process for new sales reps, facilitates effective collaboration between sales and various departments, learn from past experiences, creates top-notch sales collateral, and lastly, get more deals done. Easy access to knowledge and information enables the company’s sales team to do their jobs better, which ultimately helps the company reap the benefits of higher sales numbers.